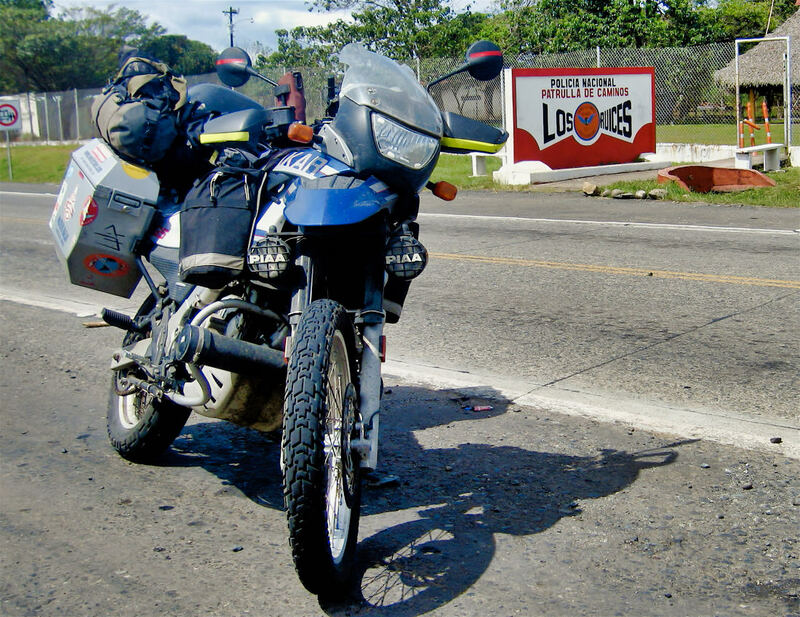 I’d already been stopped at two or three police or military check points when the policemen standing next to an orange cone and wearing a reflecting vest bear the words “transito” waved me to the side of the road. He went through the usual array of questions and asked to see my documents. He then asked how fast I was going. And while the roads are exponentially better in Panama, I’d been cognizant watching my speed — especially through areas of population. He spits out some more Spanish words I can’t comprehend and then starts walking toward the building across the street. And with the arm and flapping wrist gesture that I have become used to he becomes me to come with him. Moving his wrist in a series of rapid motions with his fingers pointing downward and slightly cupped, I am to follow him. This type of hand motion would certainly be considered rude or be more suited directed toward a young child, but is common practice here in Latin America. In the police building he tells me that I was speeding. Questioning this I request proof. Again the Spanish starts pouring from his mouth even faster, but he’s trying to tell me another policemen caught me on radar just up the road. “Where?” I insist he give me more details. He tells me back by the bridge a policeman on a motorcycle saw me. I do a scan of the room. It’s painted drab beige with only a calendar on the wall. The room is divided into two by a tall counter which he stands on an elevated floor behind. I step up and through the walkway look around. He quickly motions me back to the lower level. There simply a telephone and some books on a desk behind him which sits under a window looking out at the road. I can see my motorcycle. Without a radio there’s no way another cop could have contacted this “office”, so I asked how did the cop contact him? My friendly police officer just whips out a book and points to a series of fines and demands that the ticket will cost $60. I insist on proof. He tells me that the motorcycle officer called him using his cellular phone. This was either a comedy sketch or the cop simply thought I was a fool and soon would be digging dinero out of my pockets to buy my way out of this situation. But not me. “Let’s call him. I want to talk to him.” This infuriated the cop a bit further as he insisted this was not possible. I said sure it is you’ve got a phone right there and let’s have him come down here with his radar gun and have a look. The cop continued to balk and claimed this was not possible. He started writing the ticket. Then he pulled his book out again and pointed to another violation. This one for passing, or something. It’s fine was printed as twenty dollars. I see so now the fine has been reduced to $20 for something — both things — I had not done. I demanded to call my consulate. “I want to call my embassy!” He asked me if I had a phone. I said no and pointed to the black dial phone sitting on the desk behind the counter. He told me that was only good for local calls and that it could not call Panama City. I questioned this. We had been arguing for nearly 30 minutes when I realized I was burning time and still had quite a long way to go. I wanted to be in Panama City hours before nightfall so I could find a reasonable hotel. I told him I had to go because I wasn’t going to drive in the night. He pointed at his book and pad of tickets. I was tired of this whole game I was almost ready to hand him some money but held back. Then in a slight turn of events that I still don’t understand he took his hands and gestured with an imaginary piece of paper tearing up a ticket and tossing it over his shoulder, handed me my documents and told me I could go. As I walked out of the office back to my bike with my cop as my shadow I reached into one of my pockets where I still had about $2.50 worth of Nicaraguan Cordobas and asked him if it was possible to convert them back to dollars . He said at the bank. I stuck the bills in his hand and told him to go to the bank. I’d been in Latin American banks a couple times on this trip. Take a number. Sit. Wait. And wait. That would be his punishment because I was sure he had no idea what they were worth and it would be wroth more to him waiting an hour in a bank and completing paperwork to exchange $2,50 worth of foreign currency. One thing I neglected to mention was Panamanian currency. For the most part it’s non existent. Some time back Panama moved it’s currency to the U.S. dollar. ATM machines spit out dollars. Prices are in dollars. Dollars are everywhere. Except occasionally I’ve received some coin Balboa’s (Panama’s foreign currency named after the Spanish colonial explorer who claimed the Pacific Ocean and all that touched it as property to the crown). With a $10 bill in my pocket, I hopped on my bike and rode on. When I came up upon the vintage miniature Renault with the tongue tied down with string and the car leaning a bit hard to the right as if the passenger side rear wheel was smaller than the others, it was driving about 20 mph on the famed Pan American Highway where at this juncture the speed limit was 50 mph. So I did what most Panamanians and other Latin American drivers do, I passed it. When the motorcycle cop came up behind me honking his horn, I replied with the kind gesture in return and threw in a wave for good luck. And I continued to ride. He honked again. I honked back. Soon the gesture to the side of the road I couldn’t ignore. I started up the usual conversation with my Panamanian officer when he kept uttering the words linea doble. Okay. So I did cross the double line. I’m sure the last 20 cars the drove by did too. He just happened to see me. Catch me. And he was ready to write the ticket. And haven’t I heard all this before. Of course, I would have to wait until Monday to pay the ticket. I had no leg to stand on as I was in the hot seat. It was a $20 violation. At this point I realized I hadn’t been following my own advice. That is just to keep a few singles in my wallet. But all I had was $10. As he started barking out advice about watching my things in Panama and not to drive at night, I was scanning my brain for a way out of this one. There’s no way I wanted to pay him $10. I pulled the $10 out of my pocket and told him that was all the money I had. More importantly, I told him that I had lost my wallet and had to get to Panama City to retrieve a new ATM card. Half of this was true, as in Granada my dummy wallet somehow disappeared. But that’s another story. I pleaded with him that I needed to buy a couple gallons of gas so that I could make it to Panama. I was still a couple hundred miles away. Don’t laugh. But I asked him if he had some change! Truthfully, why not. I’ll pay the guy $5 for catching me do something that all Panamanians do an this road. He shrugged and said he had no money. We were at both ends of our respective rope. I asked if he’d just let me off this time. When he was just about to say yes I could see a light go on in his head. He then pointed to my tank panniers where I pandered to his curiosity as to what I carry on this bike. He remembered the fuel containers. The 1.5L Sigg emergency fuel bottles I have for those long stretches where gas might be hard to come by. The bottles were empty. He told me to grab the container and we walked over to his 600cc Yamaha police bike. He then disconnects his fuel line and fills up my fuel bottle. What could I do? I’m sure I’m the only guy who has received change from a traffic violation in gas — from a police bike! I handed him the $10 and headed to Panama City. Photos: (1) When your highway budget doesn’t lend you enough Balboa’s for road signs, why not offer to the highest bidder. 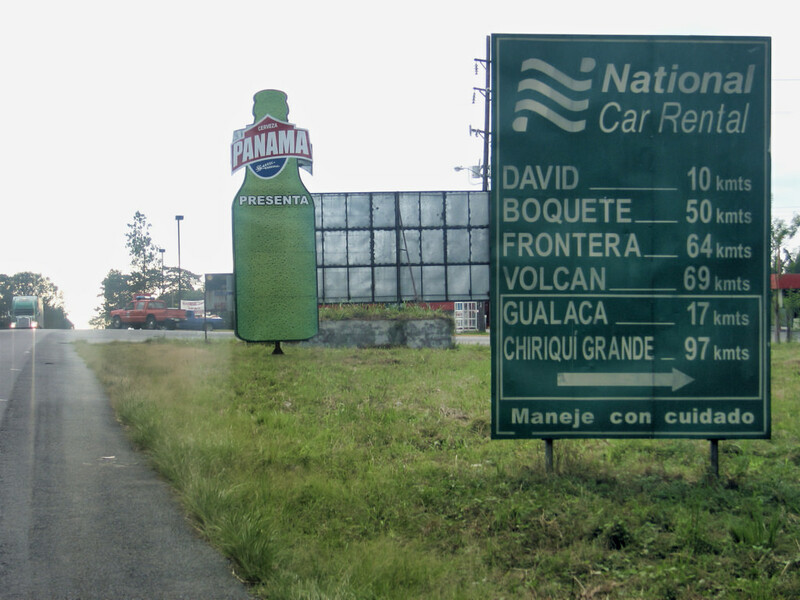 Panama does have some of the best road signs I found in Central America. National Car Rental has no comment on the return on its marketing investment. But I’m sure the number of impressions is quite high. (2) Pulled over for a Panamanian bribe and falsely accused of exceeding the “posted” speed limit. Get updates as Allan travels the world with photos, information on events, presentations, books, and the filming of Allan's new travel television show. Also get information, first access, and discounts on books and other merchandise. YES! Thank you for subscribing! I value your privacy and your name and email will NEVER be shared with anyone and I will only update you when there is news or something exciting I'd like to share.